LOST IN THE PACIFIC is the first book in a new narrative nonfiction series that tells the true story of a band of World War II soldiers who became stranded at sea and had to fight for survival. World War II, October 1942: a plane carrying eight Americans crashes into the middle of the Pacific Ocean. With only four oranges and no fresh water between them, the crew had to band together and rely on each other for survival. What they thought would be only a few hours or days before they were rescued turned into weeks lost at sea fighting off sharks, dehydration, hunger, and extreme heat. 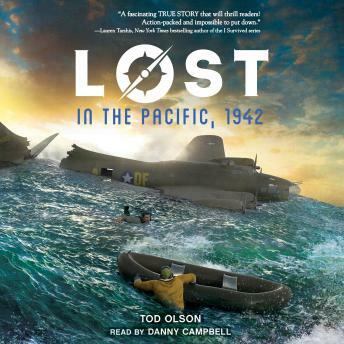 Lost in the Pacific vividly retells this incredible true story for a young audience and launches an exciting new narrative nonfiction series: Lost. Featuring black and white photographs, maps, and diagrams that bring each story to life, Lost is the perfect nonfiction companion series for older fans of I Survived and other adventure stories.